Fracking has made oil and gas recoverable in "tight" shale formations. 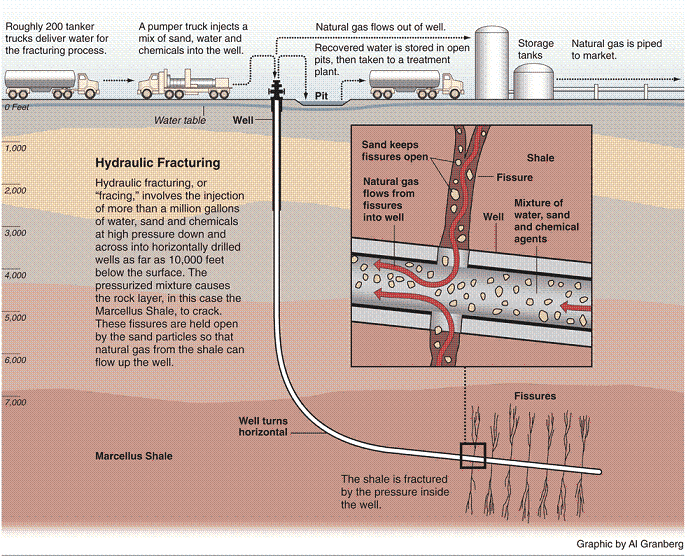 Fracking, or well stimulation, is a process in which water and chemicals are pumped into a formation of rock or coal. Fracturing is done in "tight" rock formations. Well stimulation is important because tight sands, shales and coalbed methane formations can hold vast amounts of hydrocarbons that either cannot be released any other way or the flow rate is too slow to be profitably drilled. Take the production of shale oil plays, such as in the Bakken Shale, for instance. Because the oil is trapped in tight, shale rock that is not porous enough to let the oil flow, the extraction process involves a hybrid operation of hydraulic fracturing and horizontal drilling. Natural gas drilling plays, such as in the Barnett Shale, in the United States has also exploded with a boom thanks to the technology of hydraulic fracturing. The United States contains vast reserves of natural gas; however, many were not considered economical to drill. However, thanks to the combination of directional drilling and hydraulic fracturing, vast amounts of natural gas can now be recovered at a profit to exploration companies. Tar sands also benefit from hydraulic fracturing. How? Because tar sands have to be heated to separate the bitumen from the waster material, the extraction process requires that large amounts of natural gas be used to heat the steam that drives the bitumen out of the sands. Hydraulic fracturing is done AFTER the well is drilled and cased. It is done in newly drilled wells prior to production and old wells that have either stopped or slowed in production. To frac a well, the frac crew is brought out to location along with a lot of expensive equipment. The crew then fractures the steel casing and the formation in the "target zone". The target zone is the area of rock within the length of casing that contains the natural gas. The perforation of the casing is done with materials under high pressure being strategically blasted into casing and formation. These materials are water, proppants, and chemicals. Proppants are either sand or ceramic beads. Sometimes, however, wells are fracked by injecting propane or nitrogen. Along with these gases, at times, acid is mixed in as well. This process which uses acid is called acidizing. Acidizing pumps hydrochloric acid into the formation to clean out the "holes" so the gas will flow out more easily. This mixture of water, chemicals, beads, gas and/or acid is blown through the rock formation at a distance of several hundred feet and takes 3 to 5 days to complete. These fluids are returned to the surface in a process known as flowback. The waste materials are then stored in open pits or tanks at the well site prior to disposal. Much of this witch's brew is stored in disposal wells - a special well drilled into the ground for the purpose of storing this toxic waste. Below is a wonderful video by National Geographic explaining the fracking process. For a visual explanation, be sure to watch it.